JERUSALEM – Ever since he was a teenager growing up in suburban Philadelphia, Staff Sgt. 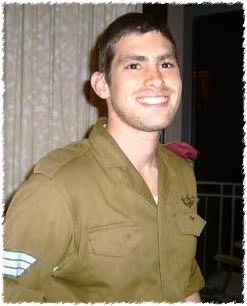 Michael Levin dreamt of moving to Israel and joining the Israel Defense Forces. He died on Aug. 1 fulfilling that dream, fighting in the service of the country he loved near the southern Lebanon village of Aita al-Shaab. He was 22. In the days and weeks since his untimely passing, many have spoken and written about the American’s dedication to his elite paratrooper unit – he was vacationing with his family in Newtown, Pa., when the war with Hezbollah terrorists broke out in July, and he promptly boarded a plane to enter the fray. But those who knew Levin also attest to his passion for Judaism. “Michael’s idealism was a total selflessness, a response from within to do the right thing,” said Rabbi Yehuda Shemtov, director of Chabad-Lubavitch of Bucks County, where Levin was part of the inaugural teens’ group. “That’s very rare for a teenager. "Michael’s idealism was a total selflessness, a response from within to do the right thing," “You saw it in his joy and happiness, and in his contagious excitement for Yiddishkeit,” continued the rabbi. According to press reports, thousands packed the Aug. 7 memorial service at Shir Ami of Bucks County where Levin grew up. Shemtov, who has known Levin’s family for many years, said a tribute to the fallen soldier will take place in the near future. According to close friend and fellow soldier Eddie Morgenstern, a Lubavitch adherent originally from Morristown, N.J., Levin was the only religiously observant soldier in his regiment. Morgenstern, who met Levin through a mutual acquaintance, said that they soon became friends. The pair often shared Shabbat dinners in Chabad families’ homes across Jerusalem. Morgenstern and Levin would talk about the approach taken by the Rebbe, Rabbi Menachem M. Schneerson, of righteous memory, toward a Jew's performance of mitzvot. Shemtov said that Levin embodied Morgenstern’s advice. And like the wide reach of a spreading fire, Levin touched an untold number of people. Mark Levin told the Jewish Exponent in Philadelphia that when he arrived for his son’s military funeral on Har Herzl in Jerusalem, he was disappointed to see so many cars lined up along the street, presumably indicating that there were many burials that day. Shemtov related a similar experience upon the Levin family’s return to Philadelphia after burying their son. “When I went for a shiva call, two people from New York City who didn’t know the parents just showed up,” he said. “Michael’s mother said it was encouraging to them that he touched so many people.